If you have not notice already, I am a big fan of Asian cuisine. 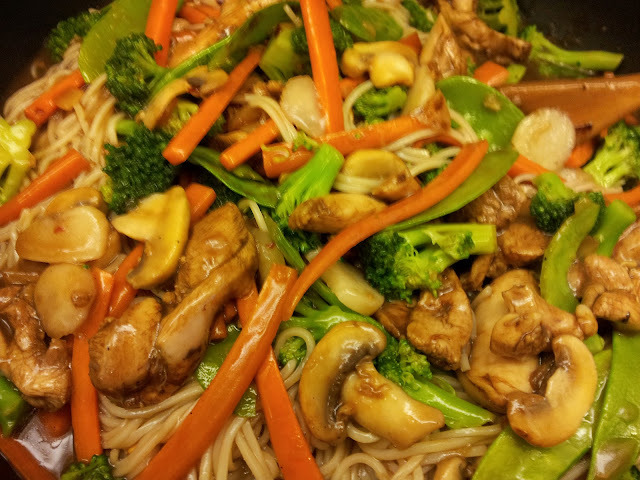 Tonight's dinner is Chicken Lo-Mein with mushroom, carrots, broccoli, water chestnuts, snow peas and Asian egg noodles. 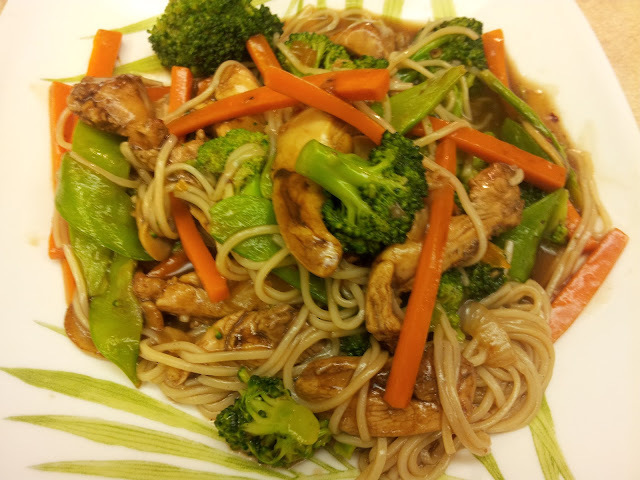 As usual I like to use Allrecipes.com for recipe inspirations and I got this recipe which I modified at Allrecipes.com: Chicken Lo Mein. Also, I see that some people like to use spaghetti or linguini for the noodles. And notice that the broccoli and noodles are done as part of the preparation before cooking the meal. Plus you have the option of marinated the meat for up to an hour in the fridge, since they are thinly sliced, I don't bother in marinating the meat. However, you will find in this recipe that I do dress the meat and then brown it. The sugar in the marinade helps out int he browning process. Also instead of chopping the ginger, I always grate it right into the pot or bowl for quickness. In a medium bowl combine the chicken, sugar, rice wine vinegar, soy sauce, sesame oil, chili flakes, ground black pepper and grated ginger. In a large sauce pot, brown the chicken with half of the vegetable oil. Then remove the chicken and set aside the same bowl. In that same large saute pot, add the rest of the vegetable oil and heat up. Saute the garlic, onion and carrots and cook until tender. then add the white mushrooms and saute for 1 minute..
Then add the red wine and let it cook for 1 minute on medium heat. Add the chicken broth and oyster sauce and bring to a boil. Add the cornstarch mix to the liquid (cornstarch and water) slowly while stirring the sauce will thicken up, lower the heat. Add the noodles, chicken, broccoli, water chestnuts, snow peas and heat all together.